This interview took a little time to come around. I thought I lost the tape, and beat myself up for a while about it but had to just give it up, though I kept an empty cassette box around with Johnsmith's name on it, it was all I could find. Then my transcriber (who types up the interviews from the cassettes) called me one day many months later, saying, "Did you just send me this tape on Johnsmith?" I said no, that I thought I'd lost the tape months ago and was very happy to hear she had it. "Yeah, we moved the furniture around in my office, it must have fallen behind something..."
Just so happened that the three things I'd lost in the last 6 months all turned up that week: the Johnsmith tape, a set of keys turned up in a jacket I only wear when it rains, and a lost song I couldn't remember how it went turned up on an unmarked tape. I thought about how hard I'd gone on myself about each of those lost things, how could I lose these important things, etc. They were lost months apart, and then all turned up in the same week. I try now not to beat myself up about stuff like that anymore if I can help it; it's just the flip side of an ego trip, and it's pointless. I called Johnsmith to tell him the news and to ask some new questions to update the information. Reading the interview, I had again been impressed by his down to earth spirituality and good natured disposition in general. Some of what he shared about his evolution as a person and as a songwriter and relentlessly touring artist even seemed connected to what I had lost and found and how I'd decided to act about it. We're not covering quite as many folk songwriters as we used to; we've gotten interested in covering more scenes, more bands, and more styles of music. 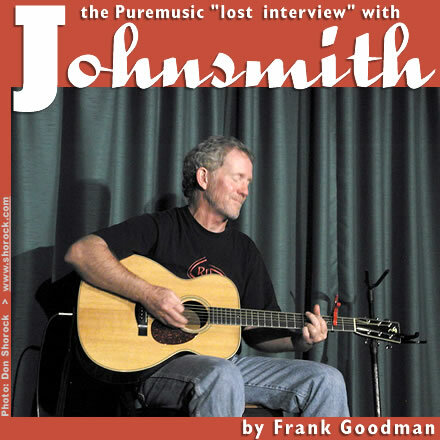 But we'll continue to cover artists like Johnsmith who are keeping the coffee house, house concert, acoustic venue and folk festival scene alive mostly by showing up fearlessly with just a guitar and their voice and a lifetime full of songs that tell the story of their journey and the journey of those whose paths they have crossed. It's the modern version of the oral tradition, and oral history. Johnsmith is one of the greats on the road today, and he's got a story to tell.